Kimberly J. Kreines is a creative designer new to the Magic team. But neither playing Magic nor writing are new to her. She has a penchant for dragons, the Oxford comma, and chicken tikka masala. In her opinion, all three are equally delightful. Sarkhan Vol has been following the voice in his head—the whispers of Ugin, the Spirit Dragon—for years now, and Ugin’s whispers finally led him to something remarkable: a flaming gate at Ugin’s grave. Although Sarkhan doesn’t know it yet, when he stepped through the gate, he traveled back in time 1,280 years, into Tarkir’s past. Sarkhan has left behind the dragonless Tarkir he knew, and he’s left behind Narset, his friend and kindred spirit, who perished at the hands of his enemy, Zurgo. He’s in the Tarkir of the past now, and he’s alone. Where a heartbeat, before there had been blazing flame and a bellowing roar. The roar had been his; it had come from Sarkhan’s own lips, lips that were still parted, his breath still rushing through them—now only as a soundless exhale. It was as though the voice had been ripped from his lungs and the world out from under his feet. A mere moment before he had been running across Ugin’s bones, running toward the flames. But now he was standing still in the darkness in the middle of a vast, snowy Temur tundra. The glowing bones were no longer underfoot. And the fire? Sarkhan turned, looking back the way he had come. There was no blazing gate. Zurgo was not there. She was not there. She was not supposed to have died. There was nothing—Sarkhan realized with a rush of vertigo—nothing at all. The ceaseless whispering, the constant flow of Ugin’s words in his head—the voice was gone! The sudden quiet was disorienting. Without the dragon’s whispers to prop him up, Sarkhan faltered. He leaned on his staff, but it could not support his weight the way that Ugin’s words could. 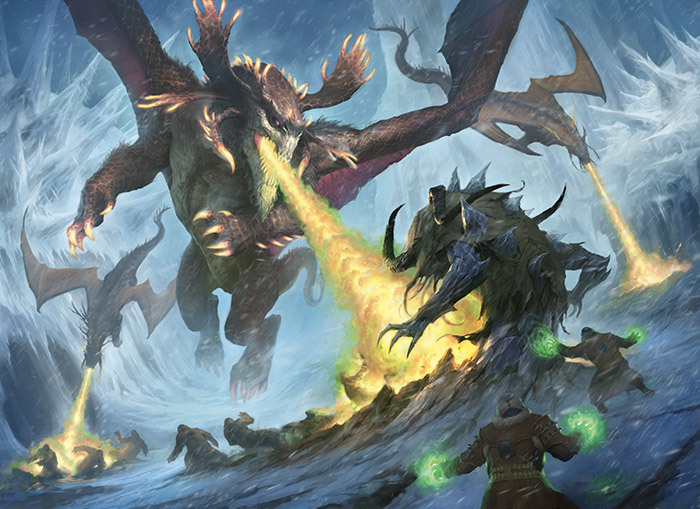 The world tilted, and Sarkhan stumbled across the snowy ground, panting. The endlessness before him, the emptiness inside him, were suffocating. He waited for an answer, but none came. “No!” How could there be nothing? How could the dragon, in this moment, after all that was, after all the worlds, all the years…after all of it, how could the dragon abandon him now? A ringing silence blanketed him in response, threatening to smother him. His coaxing turned to tugging, desperate yanking, ripping at his hair. The pain radiated across his scalp, but it did not draw an answer. In his head there was only a peaceful calm. “Ha!” The bark of a laugh issued from Sarkhan’s lips, tearing through the quiet and opening the floodgates; he erupted in a fit of hysterics. A sudden peal of thunder—an answer?—drew Sarkhan’s gaze upward, and the sight that waited sent him reeling. Thick crags of luminous clouds were heaped in the sky. They swelled like a range of towering mountains from one end of the horizon to the other. With a sharp crack, a bolt of green lightning shot through one of the ridges. It was followed by another and another. The lightning crackled and popped in a display that seemed to set the night afire. Then all at once, the clouds burst open. Torrents of freezing rain crashed down, pounding on Sarkhan’s face, slicing at his eyes. But he did not look away, could not, for the clouds had just come to life; they had begun to stir. The bluffs and peaks clambered over each other, pushing and fighting, jostling for position. They slashed at each other with their long, trailing tails; snapped their jaws; and tore apart the firmament with their razor-sharp claws. He thought he saw—no, it couldn’t be. Sarkhan squinted, shielding his face with his hand. Oh, but it was! It was! The wide, leathery appendages beat against the storm harder and harder, spawning waves of low, rumbling thunder. They labored to pull a form, gnarled and twisted, out of the fray. The form coalesced as it emerged behind the wings, opening its maw and bellowing a great, resounding roar. Sarkhan grabbed his staff and struggled to his feet only to fall to his knees once more, gasping for breath, clutching his chest, for his heart might otherwise rupture his ribs. A second dragon was birthed from the tempest, and then a third. They were wondrous, dazzling, exquisite. They were dragons the likes of which he had never seen. Tears rallied to the corners of Sarkhan’s eyes, mixing with the ebbing rain as they streamed down his cheeks. He blinked them away; they obscured his vision, and he wanted to see, he had to see. The great beasts frolicked, fledglings learning themselves for the first time. They careened across the sky, locking antlers in spirited fights—they had antlers! Sarkhan laughed gleefully. 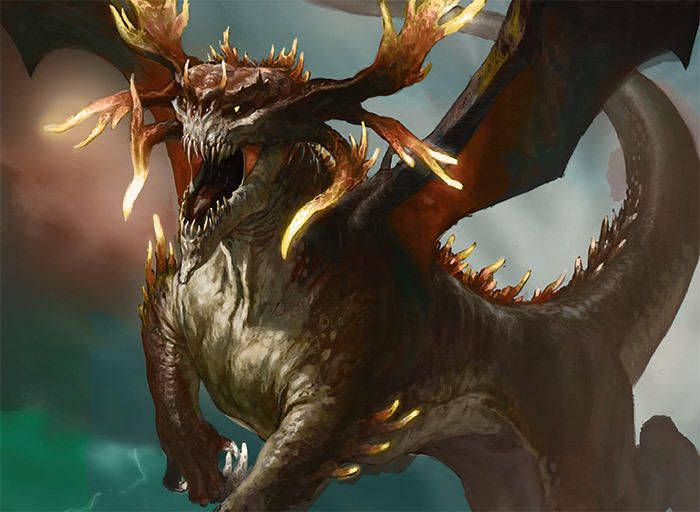 The dragons on Tarkir had antlers! A vison. A dream. It must be. 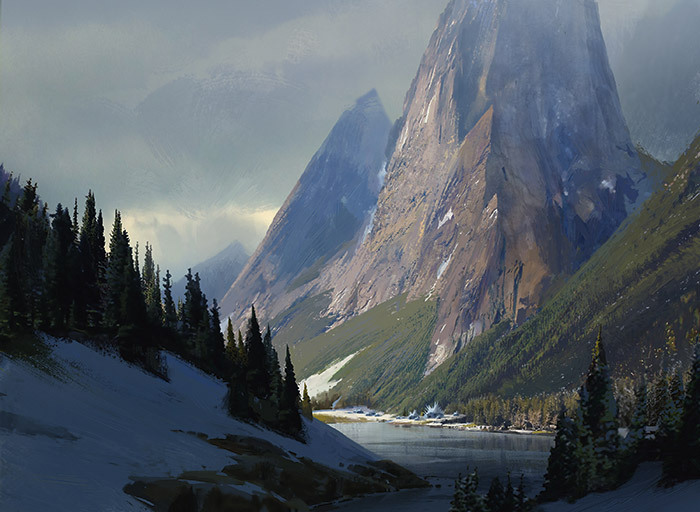 Sarkhan reached down to ground himself, placing his palm on the snow-covered rock. He gathered the white, wet slush, gripping it between his fingers, squeezing until his hand went numb. Did visions feel this cold? Could dreams make one’s fingers raw? A screech from above pierced his eardrums. The sound was palpable; it was as real as the snow. He looked to the magnificent creatures that crowded the sky. There were a dozen now, no two—more. Their wings beat against the night, sending swirling gusts of charged wind down to where Sarkhan knelt. He breathed in the brisk draft, laden with their scent. It stirred within him, filling his lungs, encircling his soul. He felt the truth of it then. They were dragons. They were real. And they were here. “Where?” He whispered the question, though he was not asking the voice in his head, nor was he expecting an answer; he knew the answer. Narset had said it. It had come from the ancient scrolls: Look to the past and open the door to Ugin. He had opened the door. Then he had walked through it. And it had led him to the past. It had led him here. Here to the Tarkir of old. Here to the Tarkir of dragons. 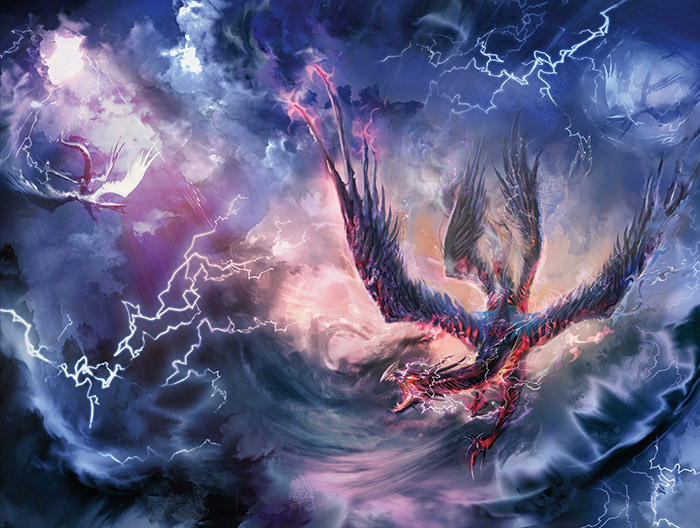 Above him the noble beasts of the sky bellowed, and Sarkhan Vol raised his voice to join the chorus. How long he had been tracking their flight—playful, lazy circles in the sky—Sarkhan did not know. He would walk in their shadows forever and feel no shame. This was his path, the path that Ugin had set him on, the path of healing for his plane. Here. Hear. Heal. The dragons knew the way. They must have heard him, for they quickened and focused their flight. Sarkhan picked up his pace, running across the snowy frontier; a staggering, jilted run that lurched and lunged. He tripped and stumbled over stray rocks and fallen branches, for his eyes were in the sky and not on the ground; he refused tear his gaze from the marvelous creatures soaring above. He could tell that the dragons were restless, hungry. They nipped at each other’s necks, snapped at each other’s tails. The two that led the pack were locked in a battle, somersaulting through the sky, hissing and spitting in blatant assertions of dominance. Their fight delighted Sarkhan, but at the same time he could feel the insignificance of it. He could sense something coming, something much more grand. The power of the fledglings, so new to the world, so limited, was nothing compared to the might of what they were about to face. He steadied himself on the stump of a fallen tree as she soared in. Born on the dark tendrils of the night air, she was the most remarkable dragon Sarkhan had ever witnessed. 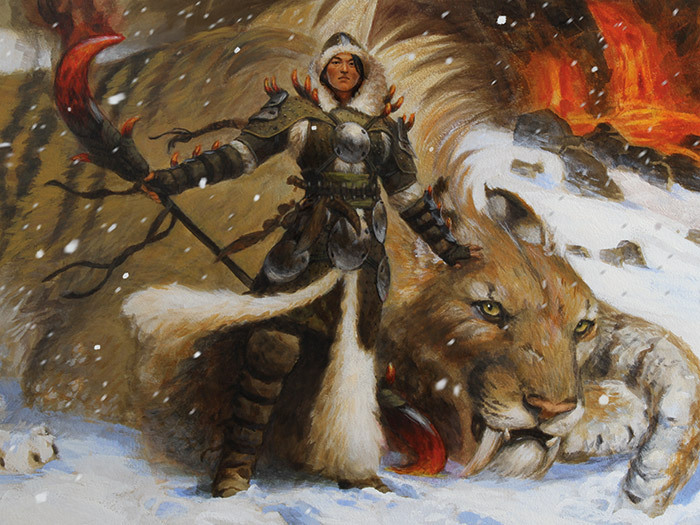 Her bestial roar, deafening and all-consuming, enveloped the entire expanse of Tarkir’s tundra. As one, the fledglings turned their attention to this majestic dragon, all vestiges of their squabbles falling away at the mere blink of her great, yellow eyes. She circled them, sniffing and nipping. Testing, welcoming. When she was satisfied, she grunted and then dove to the front of the ranks. The fledglings fell into formation behind her. She roared again, ripping the night in two. Her dragons—for they were her dragons; there was no question that they belonged to her—responded with high shrieks and screeches. Order was established, purpose was communicated. She had come to lead them. Now they would hunt. Sarkhan careened to the edge of a bluff, following with his eyes, the dragons’ coordinated dive into a valley below. He threw himself to the ground on his stomach, claiming the fringe, the perfect vantage point to relish the raid. In the basin below was a small encampment. Frenzied figures were already scattering; they must have heard the dominant’s cry, the cry that had consumed the night. But it had not been a cry of warning; it had been a resolved cry of finality. It mattered not how fast they ran, they would never outpace the beasts. The brood descended like a barrage of flaming arrows. The dominant’s fiery breath led the charge. The fledglings’ fire came after in short bursts as they tested their skill, learning their craft. And then they were on the ground. Ripping and tearing. Sinking their teeth, brandishing their antlers, and ruthlessly swinging their tails. It was a dance, a choreographed performance. In intervals they launched themselves up into the sky and dove back down at the encampment for another attack, another kill. Sarkhan reveled in it. This was how a world should be. This was how Tarkir should be. In its upward flight, one of the fledglings came mere feet from Sarkhan. He held its intense gaze, locking his with its burning yellow eye. In that moment, the dragon touched Sarkhan’s essence. It welcomed him to its world, to its brood. His transformation began without a conscious thought, without his permission, but he exulted in the familiar feeling of wings at his shoulders, the tight sharpness of his elongating maw, the rush of seeing the world through his dragon eyes. He stomped his clawed feet and stretched his wings. He would join them in their pillage. 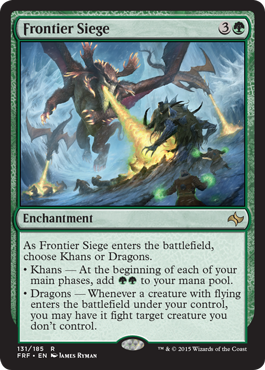 Here and now, Sarkhan Vol would finally fly with the dragons of Tarkir. He flapped his wings, preparing to launch, but he came up short. A magical, glowing claw ripped through the sky like a bolt of blood-red lighting, tearing into the side of the soaring fledgling. The young dragon screeched in pain and plummeted back past Sarkhan before crashing into the ground below. The red claw lunged again, this time tearing at the creature’s stomach. And again, relentless, spilling its innards into the snow. A sober roar followed, and a great beast, a sabertooth larger than any Sarkhan had ever seen, pounced on the dragon. It was a battle finished before it even began. “Go! Run!” It was a human voice that cut through the roar of bloodshed. Sarkhan’s dragon ears perceived it, but the speech made no sense. “I will hold them off!” This time the string of words, and the tenor—strong, solid—tugged him back toward human consciousness. He turned toward the source of the outcry, baring his teeth. “Hurry!” It was a woman speaking, a human woman, standing in the center of the basin. She wore plates of armor, a mastodon’s hide tied round her neck, and the antlers of dragons armoring her shoulders and arms. She was the one who wielded the blood-red claw. As she called out to the others to seek shelter, she drove her burning claw into the wing of a second fledgling that was feeding on a human. The young dragon started. Instinctively, it attempted to flee, but with a broken wing it was unable to take to the sky. It squawked and flopped like a fish out of water. The warrior wasted no time. As the fallen dragon turned on her, she cut through its face from eye to jaw. It collapsed in a writhing heap. “No!” The cry erupted from Sarkhan’s lips, for they were lips again—his maw was gone, his wings were gone, the moment was gone; this woman and her beast had stolen it from him. She turned with her great cat to slay yet another, but neither she nor her sabertooth landed their blow, for an immense plume of dragonfire ripped through the snowy basin, pouring endlessly from the mouth of the dominant. The woman ran from the flame. The dominant bellowed for her fledglings to take to the sky. And with a rush of wings and screeching cries, the brood disappeared into the night. Sarkhan staggered back, dark emotions surging through him, a fire of hatred heating his blood. He would kill her; he would end the warrior for this. He reached for his blade and braced to jump off the bluff, but something stopped him. A voice. When the dragons lived, there was balance. A steady, gentle voice. The plane was not in pain. A voice filled with wisdom. When dragons lived, all who inhabited Tarkir were greater. The words gave him pause. He looked to the warrior woman, the single remaining figure in the whole of the basin. She was using the glowing, red claw at the end of her staff to carve a symbol into a large rock. Sarkhan’s rage turned—to what? Awe? Elation? She was great. Greater than any human he had known before. She was a survivor—no, a conqueror!—following a battle with dragons. Dragons! Gooseflesh flooded Sarkhan’s arms. He watched her move about the basin, etching more rocks, claiming her victory. She had won the right to this ritual. “It is as you said it would be. The clans are stronger, the humans mightier.” Sarkhan turned to tell Narset. “It is perfec—” But she was not there. He swallowed the fresh wave of pain. She should have seen this. She deserved to see this. And she would. Sarkhan resolved in that moment to make it so. He would do anything, everything in his power, to make certain that when her time came, when Narset lived again on Tarkir, there would be dragons waiting for her. He smiled, picturing Narset’s new fate. She would thrive with the dragons, strong and mighty. And she would not die at Zurgo’s hands. For none of it had happened yet, none of the missteps, none of the regrets. The past was no longer the past. It was just…gone. Sarkhan could feel the weight of the years lift from his shoulders. Hundreds, thousands, he did not know. They had all melted away when he had stepped through Ugin’s fire. There was so much in front of him now. This was a new beginning, a new Tarkir—his Tarkir.